As the year comes to a close, now is good time to take the opportunity to use your journal to reflect back on what has happened in 2016, both on a personal, social, and even national level. Much of what we do in journal writing is reflection. We mostly write about what has happened in our lives, because that’s how we grow and learn. As the year closes out, and a new one begins, it’s very important to look both back and ahead. The following are some reflective questions that you might use in your journal writing to reflect back on your year. Please feel to share in the comments below other questions that come to mind that readers of this site might find useful. What was the best thing that happened for you in 2017? What were your biggest challenges this year? What risk(s) did you take? What was the most important lesson(s) you learned in 2017? Who are the people you sustained relationships with this year? How did you take care of yourself this year? What did you not get done this year that you need to work on next year? Who and what inspired you the most this year? If you wrote a book about this year, what would be its title? List of books read this year. List of movies you watch this year. List of the important newsworthy and memorable events that impacted you. List of friends and acquaintances this year. Things you lost and found this year. Be sure to bookmark your year-end reflection entries in your journal, and/or put a reminder on your calendar for next year this time to revisit these entries. It’s always useful to review what you wrote in previous journal entries,, because we often forget things, especially when we feel overwhelmed and challenged. Looking forward to next year, be sure take on the National Journal Writing Challenge for January 2018. 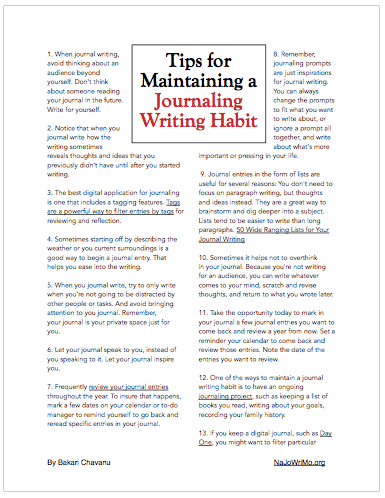 If you have been following behind in your journal, January is a great opportunity build or rebuild a journal writing habit. It’s also great time to set some goals for yourself that you want to achieve next year. If you’re not a subscriber to NaJoWriMo, be sure to sign up today. You will get notified about the first few days of NaJoWriMo January. If you want, you can sign up for NaJoWriMo January prompts and have them sent to you via email for each day of the month. Note: you can now sign up for NaJoWriMo prompts anytime you want. But if you want to start receiving prompts for January, be sure to sign up on December 31st. You will receive your first prompt in the email on January 1st. I wish you a happy new year, and I look forward to hearing from you about how your journal writing is going, and how you plan to use journal writing to achieve your goals and aspirations in the year to come. Please feel to share other questions that come to mind that readers of this site might find useful.